Original artists, original music. LiveConnections brings you unique collaborations and fresh sounds from some of the best artists today, in the intimate atmosphere of our partner venue World Cafe Live. 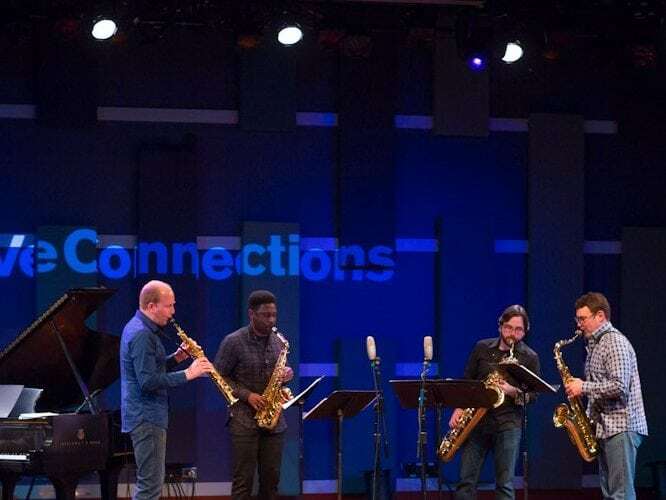 LiveConnections is pairing Grammy-nominated pianist and composer Uri Caine with esteemed saxophone ensemble PRISM Quartet for a concert of adventurous new music. Building on the artists’ reputations as innovators, LiveConnections has commissioned Caine to write new music for the Quartet that fuses modern jazz and new classical styles. Catch the energy and innovation in the dynamic Downstairs Live venue at World Cafe Live, Philadelphia, while enjoying dinner and drinks. Doors open at 6:30pm for dinner; the show starts at 7:30pm. Sponsored in part by the Presser Foundation and PRISM Quartet, Inc.